China is now seeing an influx of LPG traders starting new LPG propane dehydrogenation (PDH) units, increasing the country’s propane consumption due to their fully equipped facilities such as port jetties and LPG storage tanks. With propane demand from Chinese PDH units now becoming strong, there is growing demand for LPG in China. What does this mean for global market players importing LPG into China for the production at PDH units? 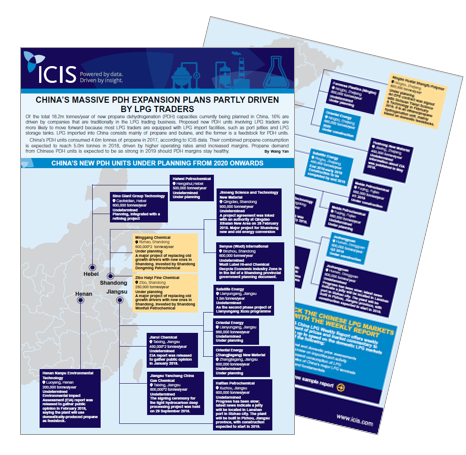 Download the free infographic that shows the upcoming PDH units in China and expected capacities to come on stream by 2021, and gain visibility on the hot trading regions for LPG in China.